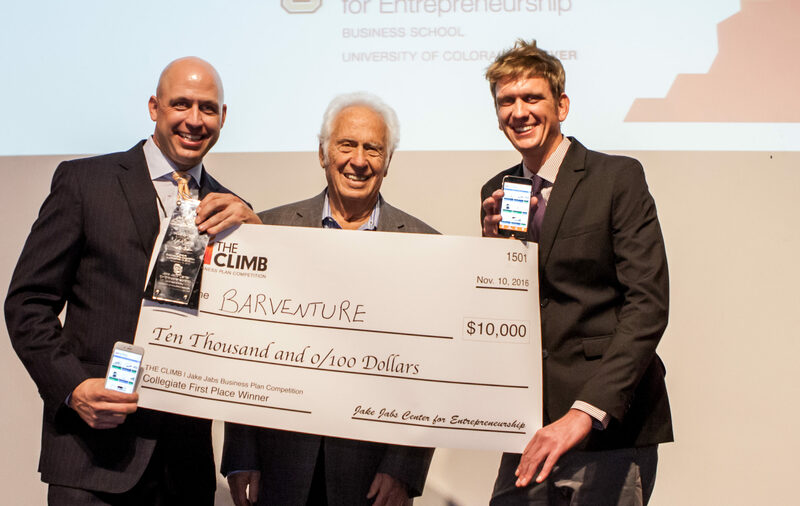 An innovative app that connects bars to costumers with special discount offerings won the collegiate first prize at this year’s THE CLIMB | Jake Jabs Business Plan Competition, an annual business plan challenge sponsored by the Jake Jabs Center for Entrepreneurship at the University of Colorado Denver Business School. 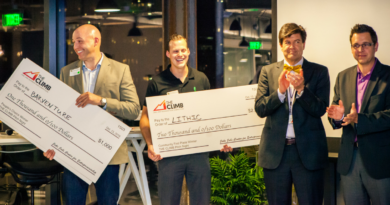 Patrick Brown, Elliot Bath and Devin Hougard, founders of the BARVENTURE app, took home $10,000 and a selection of in-kind prizes to support his technology-based business. The second place collegiate prize of $7,500 went to Pocket Passer, a family-fun game that combines the outdoor game corn hole with football. 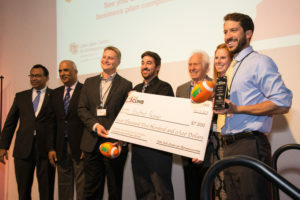 Velocé Corporation claimed the third place title, winning $3,500 for its idea to develop a system that uses wireless controls and an ingestible capsule to release drugs to targeted areas of the gastrointestinal tract. 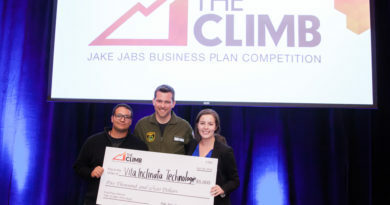 For the first time in the competition’s 15 years, THE CLIMB also invited Colorado community startups to enter the competition and submit their business plans. 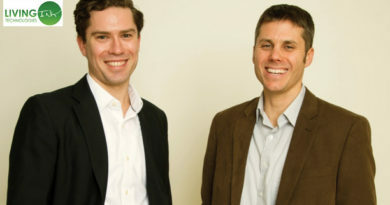 The first-ever winners of the community category taking home $7,500 were Dave and Lars Baugh for their cricket-based protein products company, Lithic Nutrition. Barmade, an inventive machine that mixes cocktails with the push of a button, won $3,5000 for the second place community prize. The final ascent of THE CLIMB began with an exciting semi-finals round of business pitches Thursday, Nov. 10 at Space Gallery in Denver. The top ten startup teams in the competition had the opportunity to pitch their businesses live on stage to an audience and prestigious panel of judges, which included Molly Berger, executive director of TiE Rockies; Jonathon Musser, senior vice president of Silicon Valley Bank; Kassendra Galindo, corporate and securities attorney at Cooley; and Rob Carpenter, founder and CEO of AppIt Ventures. The five highest-scoring teams from the semi-finals were chosen to present at the finals that evening. 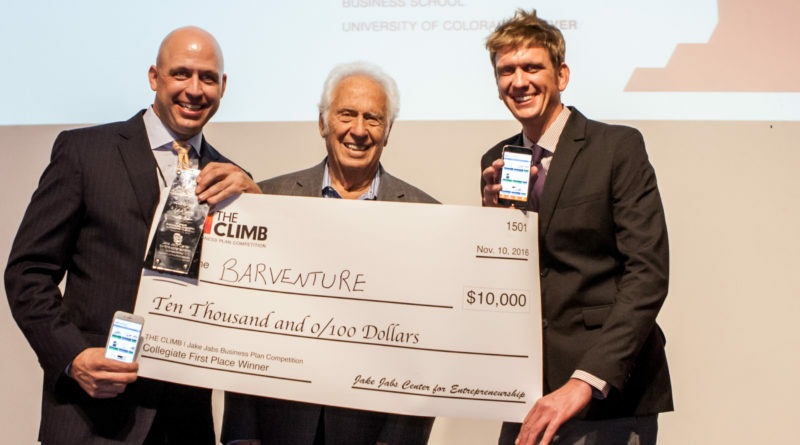 THE CLIMB Finals event was an elaborate affair featuring five of Colorado’s top startup companies. Event attendees included Dr. Rohan Christie-David, Dean of the CU Denver Business School, and Associate Deans Dr. Dawn Gregg and Dr. Cliff Young. Molly Hughes, director of Denver Post TV and Emmy-award winning news anchor and reporter, commanded the stage as emcee as all five Colorado-based teams presented a five-minute business pitch to a full room and panel of judges. 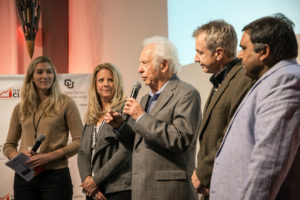 The panel included event namesake Jake Jabs, founder and CEO of American Furniture Warehouse; Kate Shillo-Beardsley, director of Galvanize Ventures; Cynthia Banks, president of Foundation of Global Scholars; Scott Wyatt, CEO of Advantage Integrated Solutions; and Gyan Saxena, founder of TiE Rockies Angels. More than 150 people attended the 15th anniversary event, which included a discussion with namesake of the competition, Jake Jabs, who shared his story of entrepreneurship from guitar salesman to CEO of American Furniture Warehouse. “If you love what you do, you will never work a day in your life,” was the advice Jabs gave to the competitors about the business of starting and owning a company. The evening concluded with the announcement of THE CLIMB 2016 winners. It proved to be an exciting event, and all the winning teams will continue to receive support from the Jake Jabs Center for Entrepreneurship. 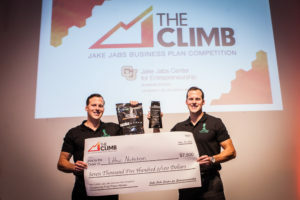 THE CLIMB | Jake Jabs Business Plan Competition is an annual business development event for collegiate and startups based in Colorado, Wyoming, Montana, New Mexico and Arizona, and non-collegiate startups based in Colorado. With more than 500 mentor hours shared and $1 million awarded to date, THE CLIMB celebrates 15 years of guiding entrepreneurial thinkers to greatness and empowering them to blaze their own trail. For more information about THE CLIMB and the Jake Jabs Center for Entrepreneurship, visit jakejabscenter.org.